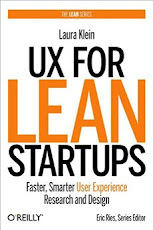 Recently, I've been experimenting with new ways of delivering information about UX for Lean Startups. Yes, this is a very poor excuse for not blogging as much. But it's also a genuine effort to get information about user experience design to new people. As part of this effort, I'm making a series of short (10 minutes or so) videos for UXD for Developers. This is a show on YouTube produced by the folks at the Android Developer Network at Google. Two of my videos are already posted, and at least one more is on the way. A list of all the videos (including some that I'm not in) is here: UXD for Developers. In my episodes, I cover an Intro to Lean UX and Qualitative vs. Quantitative Research for UX. New episodes are released every Tuesday, so make sure to subscribe to the channel to get all the updates!